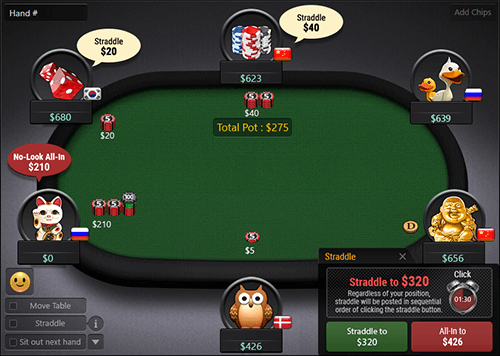 Introducing the world’s first straddle variation in which any player can post a straddle bet regardless of position. 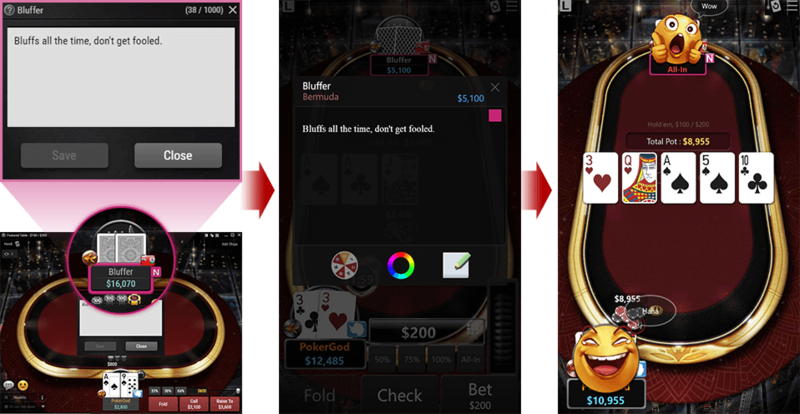 Forgoing the turn-based position theme, our straddle variation will allow any player to post a straddle bet before the hole cards are dealt. It can basically be thought of as an auction with the highest bidder being the last to act pre-flop! Once the first person straddles, then a timer will be initiated waiting for any person to straddle next. To make it more exciting, after the first straddle bet is posted, all players will be given the option to either straddle or go all-in! 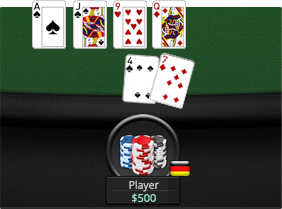 We call this the ‘No-Look All-In’ due to the fact that the player has another choice to move all-in even before the cards are dealt. 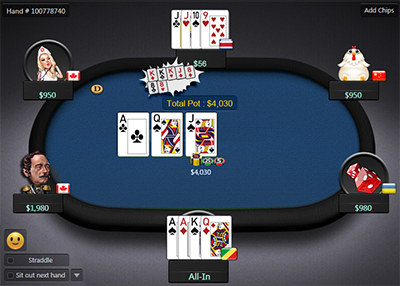 In the case of an all-in, the next possible straddle bet will have to be larger than the corresponding all-in amount. 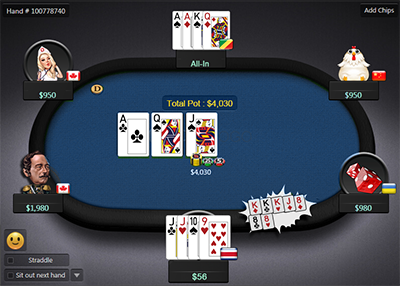 In addition, a player who goes all-in with an amount below the next straddle amount will not be able to act last pre-flop. We do not charge extra rake for hands that Run It Twice or Run It Three Times. 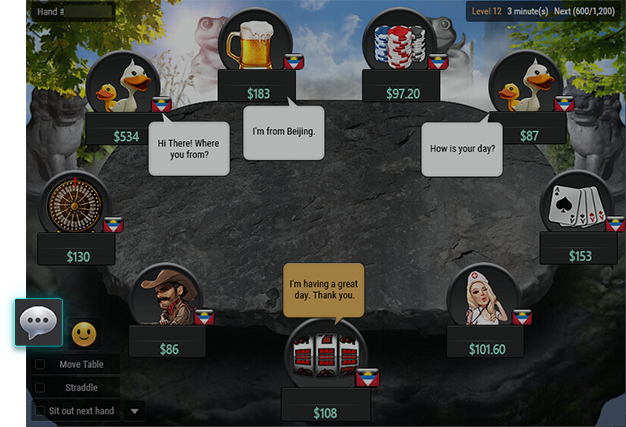 Deal Choice is a feature which allows the Underdog to slightly increase their odds of winning when they are in a losing all-in situation and also makes the game more exciting. During an all-in situation, the Underdog will be able to select one of the following: Run It Once, Run It Twice, Run It Three Times. 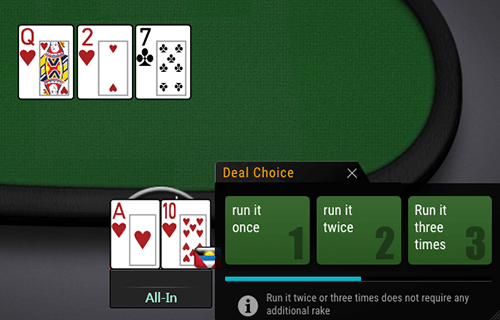 Run It Twice (RIT) or Run It Three Times (RITT) allows players to have the remaining board cards dealt two or three times when two players both go all-in. 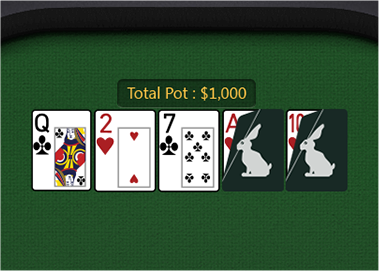 The amount in the pot is also split into two or three different amounts to be played out to different boards. When an Underdog chooses to Run It Twice or Run It Three Times, if the Favorite decides to accept All-In Insurance or rejects the Underdog’s Deal Choice, then the board will only run once like a normal game. The Table Chat is added to the menu on Tap the input box (where the red arrow is Once you send a chat, the text balloon will the right side. pointing) to enter text. appear as seen below. 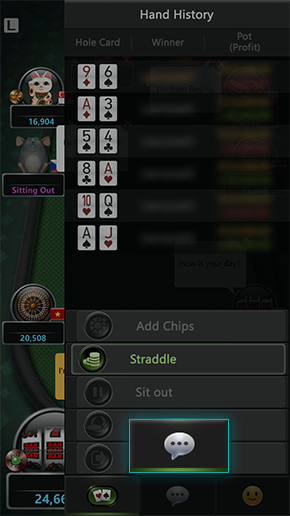 When the Table Chat option is available, you will be able to find the chat button in the lower left section of the table. What kinds of behaviour are prohibited in the Table Chat? 1. Profanity/Abuse: We do not permit continuous profane, vulgar, racist or abusive/insulting chat (even in the form of metaphors) at our tables and it may be subject to a warning or suspension. 2. Unethical/Malicious behaviour: It is strictly prohibited to use the chat for any unethical and malicious behaviour, including but not limited to criminal activity, fraud, spam, harassment, or stalking. 3. Flooding: The sending of multiple and frequent messages can lead to a chat ban for a specific period. 4. 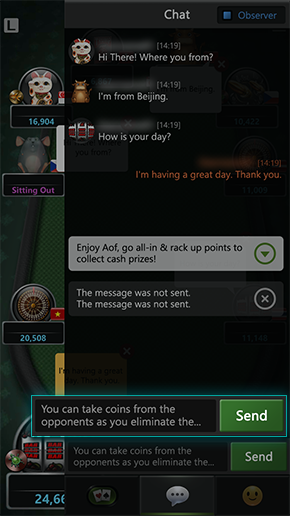 Collusion: It is strictly prohibited to use the chat to participate in the act of collusion, including but not limited to sharing your hands or discussing the card play of any player including yourself. 5. 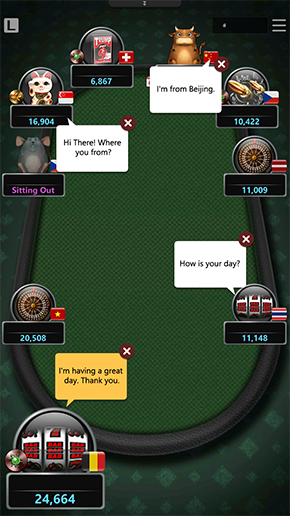 Sale of money: Players are not permitted to engage in any discussion regarding the sale of money within our chat. Any such discussion, including the offer to buy or sell money in the chat, is grounds for warning or revocation. 6. Commercial use: It is strictly prohibited for a user to use chat for any commercial use whatsoever, including making any statements which promote the service or product of any party. If you’re tired of all the ruckus, try using our Helmet Mode feature! 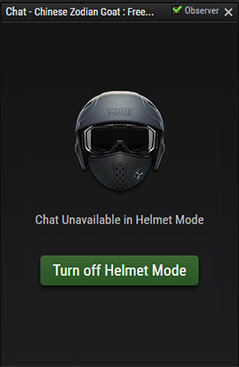 With Helmet Mode, you can disable table chat and focus on your game. · Helmet Mode is also available in tournaments. · Observers cannot use this feature. 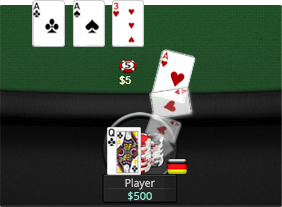 This feature allows for players to show one or both hole cards to opponents. 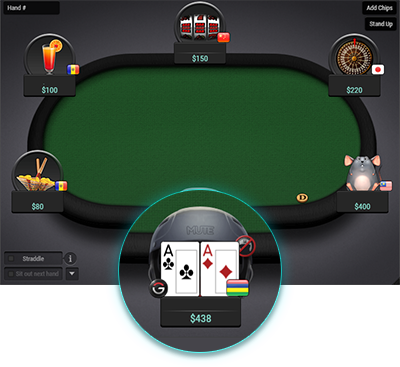 Upon selecting the option to Show Card, the selected card(s) are shown to the opponents. 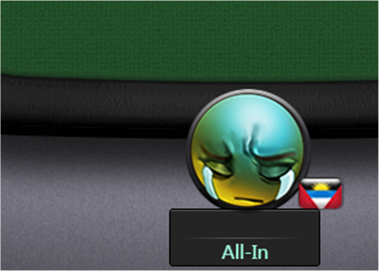 Whether or not you folded before showdown, the three Show Card options (found in the bottom right corner of the table image shown above) will quickly appear on the screen when the hand is over and you may or may not choose to click it. Please note that it will only be available for a quick moment before the system mucks the cards and deals the next hand. This means that by not choosing either option, your hand will simply be mucked when the time given comes to an end. Shout-out the cards you will need to become the winner and it will be displayed accordingly. The winning cards await your shout out! 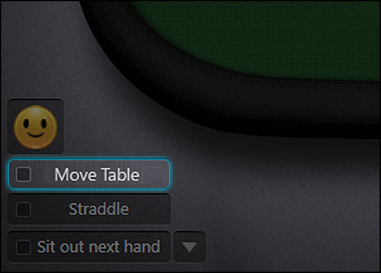 The Move Table option will move you to another table with the same criteria as the one you are playing at. Once you are moved to a new table, it will be logged as a new session and the buy-in process will be initiated again. Heated moments are engaged through different sounds and visual effects. Rabbit Hunt reveals what cards would have appeared if a player decided to play out one’s hand. 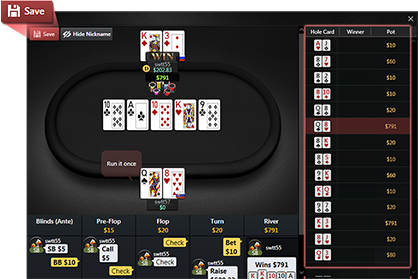 Want to see if you would have hit your flush on the river? Use our Rabbit Hunt feature to expose what could have been. Every hand is stored as a ‘Moment’ depicting all the aspects of your experience as an image. So, not only can you easily absorb the full details of each hand, but you can also save it and share your greatest and funniest moments!